Happy 72th Independence Day India ! Where is the crypto market heading now ? Happy Independence Day, So we are back with another cool blog for you guys.Hope you are enjoying our previous blogs.In this we will discuss whether the Crypto market is goin up or down now. Past 1-2 weeks were just very bad for the crypto market, if not the worst.Market capitilization was dropping in billions almost daily.Everyone was curious to know whether this is the end of the crypto or not .It was not only the bitcoin which was falling but the altcoins were bleeding very badly. But today we saw a pump in the market, when Bitcoin took a sudden jump of 400-500$ and ow it is trading near 6400$.Altcoins are also following the same upside pattern. Is this the Bull Run Again ? At the time when many of us were predicting Bitcoin further slump to 5500$ level and 5000$ level, it again proved many of us wrong and took a jump forward and liquidated many short orders.This is an sure-shot example of whale manipulation.They just try to create Fud in the market so that they can accumulate Bitcoin and other altcoins in throwaway prices.Many of the small investors do panic selling and this is what the whales want. When Btc rise about 5-7% many of the altcoins are up by 8-20%.Finally after a very bad phase we are seeing the greenery in the market but who knows this might be another bull trap.Just take your position accordingly and keep booking profits. For all the Indian friends, many many wishes of the 72th Independence Day of India.Freedom is the most important thing one can get, thanks to all the freedom fighters who fought for the Nation.There sacrifices can't be forget.This Independence day, take pledge to serve the society, serve the nation. As told in last blog, we are very much bullish about the crypto future in the last quarter of 2018.With ETF approval and R.B.I decision in September, market can touch new heighs again.Don't worry about temporary falls, Blockchain technology is here to stay. See you in our next blog ! Don't forget to comment down your views. Very happy Independence day sir !! as i am a also a citizen of India. 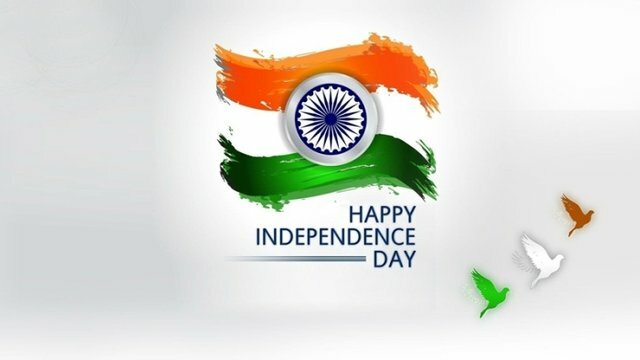 i would like to wish everyone happy independence day and i am new to steemit and want to request everyone to follow me and i promise you to bring new interesting blogadand articles for you. I don't think that BTC and alts will reach ATH this year...Coz it's already in so much dip...It will need approximately 400-500% growth which doesn't seem to be feasible. @moneyguruu Happy Independence Day Bro!!! Happy independence day to you as well sumit sir. Sir what is your opinion.????? where is the crypto market? Happy independent day ap ko bhi sir and you are my icon sir. Good job on youtube . @moneyguruu ,which is the best wallet for crypto currency for indian users? Happy independence day to you and all my friends. Happy 72nd Independence Day to all my dear Buddies. @moneyguruu freedom in the mind faith in the words pride in our hearts and memories in our souls. proud to be an INDIAN..! happy independence day sumit sir, i hope crypto market will start improve from here. loved your posts on you tube. Same here Mr sumit but the happiness of the crypto market is missing. i have a question @moneyguru you have so many upvotes and comment on your post but why you are not getting earnings like before? is this the reason that you haven't post in the last two weeks!!! NO i am not paying bots for now i will be taking 1 post in week or 2 weeks with bot on top of steem platform . @moneyguruu sir I would like to know which bots I can use to get return on investment..??? Its still in bearish trend as per the technical chart and price action . Happy Independence Day Sumit Sir....i follow you on youtube....your youtube videos on steem it are very much helpful for me to understand about the steemit platform...Thank you for the videos. First of Happy Independence day to all and specially You too , thought it is late. I have learn a lot form you about steemit, your youtube videos are turned my life into Steemit platform , Since I am new boarn baby in steemit , My growth not so much faster; but using your tricks following your every comments by heart I am trying to mange and build up my steemit account. 2nd one I strongly believe crypto market is just a fall this just an operator game like nse bse, it will be recovered soon. If Bitcoin not going to bear trap and sustain above 6636$ level then it have chance to touch again 8500$ , Am I talking right ?? sumit ji please give me your feedback if possible. Happy Independence Day from Pakistan.